The week-long party leading up to Isha Ambani's wedding is going to cost an estimated $100 million, according to Bloomberg. Beyonce during a performance at the Ambani party in Udaipur. Isha Ambani's father is the richest man in India. Her family's Mumbai home, named for the mythical Atlantic island Antilia, has 27 stories, three helipads and is estimated to be one of the world's most expensive properties, second only to Buckingham Palace. She has degrees from Yale and Stanford and sits on the board of directors for India's largest retailer and its largest 4G network. And just last week, Ms Ambani, 27, stood beside Priyanka Chopra as the international star wore a 75-foot veil and married pop singer Nick Jonas. So how does a gal make herself stand out amid so much opulence? Ms Ambani is about to be married, and at her pre-wedding festivities on Sunday in Udaipur, Rajasthan, Beyonce performed a private concert for the bride-to-be's guests. It wasn't just a few songs, either. At the luxe Oberoi Udaivilas hotel, Beyonce sang "Crazy in Love," "Naughty Girl" and "Perfect," according to reports, and cycled through several outfit changes that were detailed in the Indian media. Beyonce's private concert has helped draw international attention to the wedding of Ambani and Anand Piramal later this week. 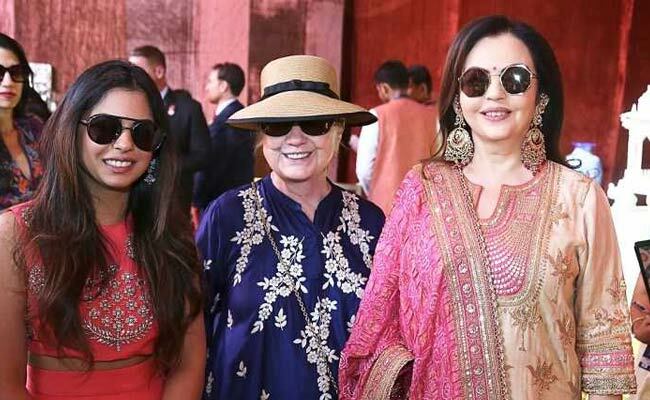 The lavish, days-long celebration has been dubbed "the big, fat Indian wedding," and the guest list -- which includes Hillary Clinton, Arianna Huffington and much of Bollywood - explains why. Attendees arrived by chartered planes and luxury sedans, reported Reuters, and were given access to an app that mapped out the wedding festivities. Other VIP guests reportedly included newlyweds Priyanka Chopra and Nick Jonas, legendary Indian cricket player Sachin Tendulkar, 21st Century Fox CEO James Murdoch, and Bollywood stars, such as Deepika Padukone and Ranveer Singh, who were themselves married last month at a lavish ceremony in Lake Como, Italy, and Aishwarya Rai Bachchan. The week-long party is going to cost an estimated $100 million, according to Bloomberg. A family representative told Bloomberg that the Ambanis set up a bazaar to showcase the work of local artisans, and donated enough food to the city of Udaipur to feed 5,100 people three meals a day for four days. The union of Ambani and Piramal will bring together the business empires of two of India's wealthiest, most influential families. Mukesh Ambani is the 19th richest man in the world with a net worth of $43.4 billion, according to Forbes. He is chairman of Reliance Industries, an oil and gas company that his father began as a small textile manufacturer in the 1960s. In 2016, Ambani founded the 4G phone service Jio - an idea planted years earlier by his daughter while she was a student at Yale. Isha Ambani graduated from the Ivy League institution and worked as a business analyst in New York, according to the Economic Times. She later joined the boards of Jio and Reliance Retail, a branch of Reliance Industries, and earned an MBA from Stanford. Ms Ambani's mother, Nita Ambani, is an international power player in the realm of philanthropy. She founded the Dhirubhai Ambani International School in Mumbai, oversees the Reliance Foundation, and is India's first female member of the International Olympic Committee. Her soon-to-be husband, Piramal, 33, is the executive director of the Piramal Group, a business conglomerate founded by his father, Ajay Piramal. The elder Piramal has an estimated net worth of $4.2 billion, according to Forbes, making him the 24th wealthiest person in India. Anand Piramal has degrees from the University of Pennsylvania and Harvard. He founded Piramal Realty and Piramal Swasthya, a rural health-care initiative. The Ambani and Piramal families are longtime friends, reported the India Times, and the bride and groom have known each other since childhood. 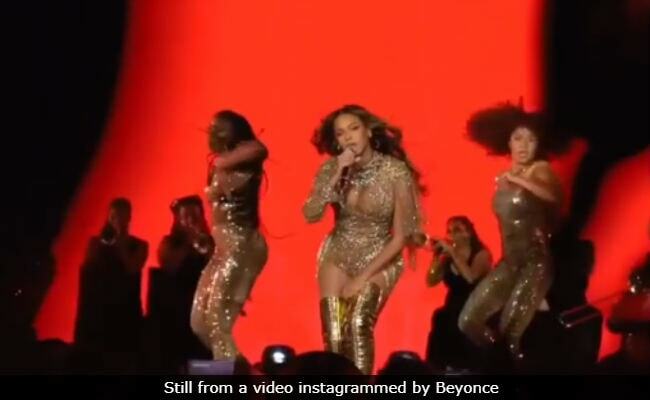 Beyonce's weekend performance was the culmination of two days of celebrations as part of the couple's wedding sangeet, a traditional party that takes place in the days leading up to the formal wedding ceremony. Before Beyonce stole the show, eyes were on Hilary Clinton and another former secretary of state, John F Kerry -- both of whom danced the bhangra, a Punjabi folk dance, on stage with the Ambani family, according to India Today. The festivities in Udaipur ended with the weekend, and guests will head to Mumbai for the wedding, which is scheduled to take place on Wednesday at Antilia, the Ambani family home that has a staff of 600 people, six floors of parking, and can withstand an earthquake of eight on the Richter scale.